One feature that is going to make it much easier to create multi-targeted NuGet packages is the ability of the vNext platform to package compiled code directly into NuGet packages. By default vNext applications don’t compile to disk but rather create source code in the AppCode folder. A running application then reads this source code and compiles the code on the fly via Roslyn to execute it from memory. However, if you build class libraries you can also optionally write out the result to disk, which creates a NuGet package. That’s cool all by itself, but what’s even nicer is the fact that you can create multiple build targets for different versions inside of that NuGet package. 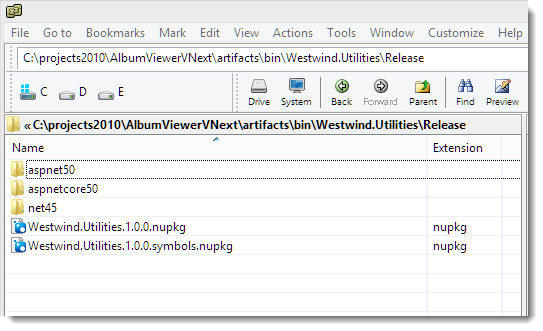 You can create output for vNext Full and Core and even standard .NET and PCL components – all from a single project! 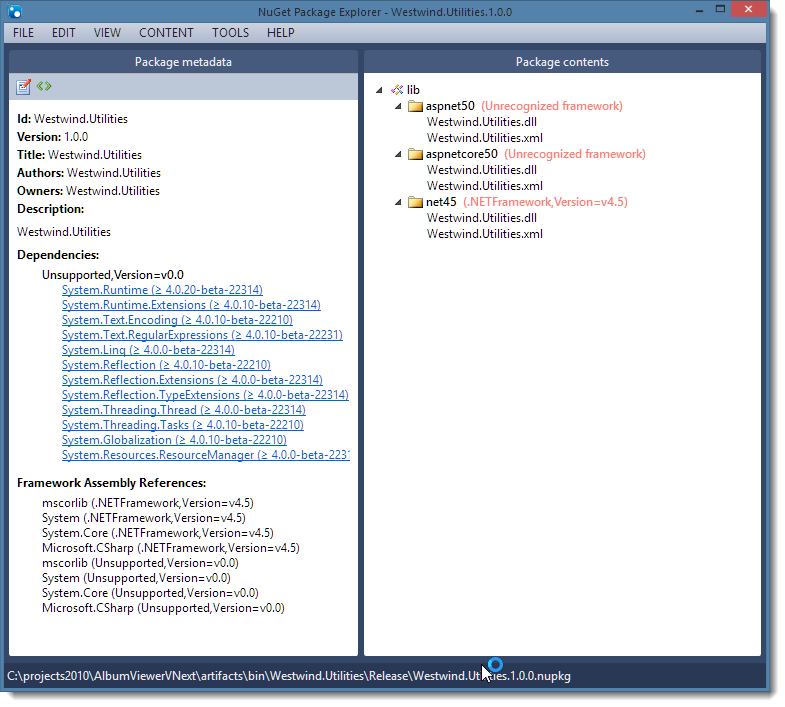 This package contains output for vNext Full CLR (aspnet50), vNext Core CLR (aspnetcore50) and the full .NET Runtime (net45). If you’ve built multi-targeted assemblies and packages before you probably know how much of a pain this was in previous versions of .NET and Visual Studio. You either had to hack the MSBUILD process or else use separate projects, Solution build targets or separate solutions altogether to accomplish this. In vNext you can do this with a few simple project settings. You can simply build your project with output options turned on both from within Visual Studio or from the command line without using MsBuild (yay!) 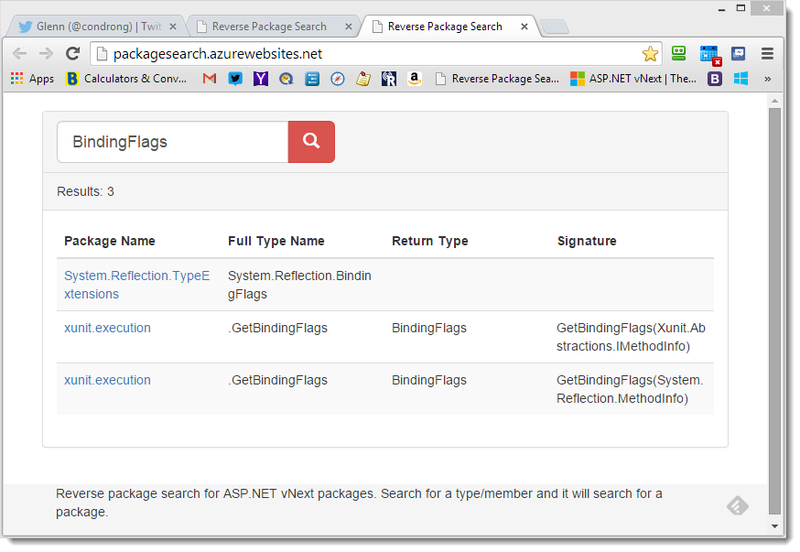 and produce a NuGet package as shown above. 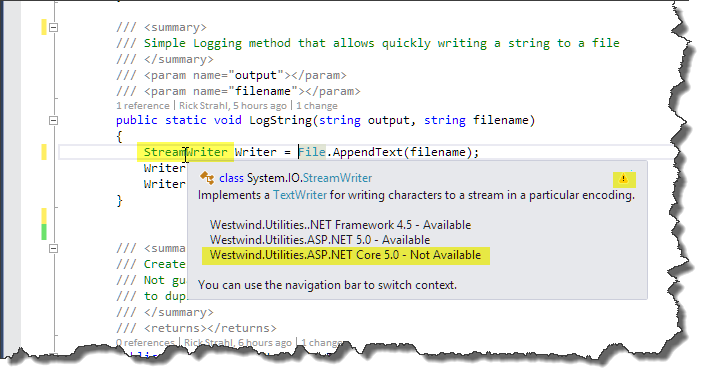 For initial testing I used my Westwind.Utilities library and just pulled out one of the classes – the StringUtils class. I used this one because it has very few system dependencies so I hoped it would just run as is even under vNext. Turns out it doesn’t – even this very basic class has a few pieces that don’t exist under vNext or at least not with the same signatures. Which makes it perfect for this example as I have a few methods I need to bracket out for Core CLR usage. In order to set this up the first thing I did is create a new Class library project in Visual Studio. 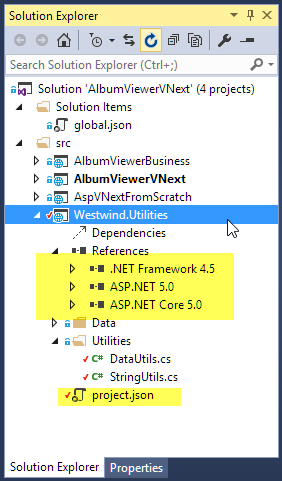 By default Visual Studio creates a project.json file with the two ASP.NET nNext targets (aspnet50 and aspnetcore50). In addition I explicitly added the .NET 4.5 target (net45) in project.json (which is actually what’s shown in the project above). The three highlighted targets correspond to the References nodes in Visual Studio project and correspond to the 3 different build targets of the project. Note that I also explicitly have to reference any of the BCL components I’m using in my component for the Core CLR target. The other two are getting these same components from GAC components of the full CLR so they don’t need these. Since I’m including a ‘classic’ .NET 4.5 target here I have to be careful of how I add references – all vNext references that apply to both vNext Core and Full CLR need to be explicitly assigned to their dependency nodes, while any dependencies of the the full .NET runtime needs to go in its dependency section. If you target only the two vNext versions you can use the global dependency node for any shared components which is a lot less verbose. Note that for the Core CLR I have to manually add all the little tiny packages for the BCL classes that used to live in mscorlib and system. I added these as I started tweaking my component – they aren’t there by default. The only default component is System.Runtime. While adding every little thing is a pain it does help with modularization where you get just what you ask for and nothing more. But to be honest I find it hard to believe that anything less than what I have above would ever not be used by either my own code or any referenced components (minus the regex maybe) so maybe this is just getting a little too granular. If you’re building projects that use more high level components (like EntityFramework or the new ASP.NET MVC) you’ll find that most of the things you need to reference are already referenced by those higher level components, so some of this minute package referencing goes away. But if you’re writing a core component that has minimal non-system dependencies you’ll find your self doing the NuGet Package Hula! Once you have your targets defined you can start adding some code. If your code just works across all the targets defined you’re done. Writing greenfield code it’s not too difficult to write code that works across all platforms. In my case however, I was backporting an existing component and I ran into a few code references that didn’t work in the Core CLR. Note the first 3 errors refer to StreamReader related errors. Apparently StreamReader doesn’t exist in vNext or I’m missing a package reference. I can see that the problem is in aspnetcore50 based on the project name in the Project column. It’s a bit odd that StreamWriter is not working. In fact most of the stream related classes in System.IO don’t appear to be there. It makes me think that either I’m missing a package or this is still under heavy construction by Microsoft. Either way it demonstrates the point that there may be things that may not work with Core CLR. If I then recompile or pack the project, I’ll get no errors. The compiler constants available for the three target versions in this project are: ASPNET50,ASPNETCORE50,NET45. Each of these #define constants are implicitly created as upper case versions of the defined frameworks in project.json. You can use either of these to take particular action or bracket code for compilation. Once added I can now use in code just like any other package. When this Web project uses this ‘project reference’ it pulls the source code for the Westwind.Utilities and compiles it on the fly and executes it. You can see here that LogString is available for Full CLR operation, but not for Core CLR operation and IntelliSense lets you know. The compiler too will let you know that if you use LogString and targeting the Core CLR you will get an error. As you can imagine bracketing code out is not always a good idea – it makes it much harder to reuse existing code or migrate code. But it’s quite common as you can see by the heavy refactoring that’s happening in the core BCL/FCL libraries that Microsoft is reworking and the many missing features that just aren’t there (yet?). When I built my project above I simply use the default build operation which doesn’t actually generate any output. By default vNext runs the code directly from source code and compiles it into memory. In vNext the compiler acts more as a syntax checker than an actual compiler when you click the Build button in Visual Studio. 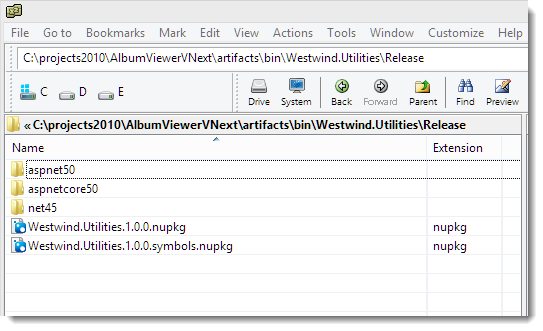 Note that the current Package Explorer doesn’t understand the new vNext runtime versions yet, but that’ll change and hopefully Microsoft will consider moving some of this functionality right into Visual Studio and the build dialog to edit and adjust the package meta data. Creating multi-targeted libraries is never easy, but these new features in vNext at least make it a lot easier to manage the process of building them from a single source code base without having to heavily tweak the build process – it just works out of the box. "It’s a bit odd that StreamWriter is not working. In fact most of the stream related classes in System.IO don’t appear to be there. It makes me think that either I’m missing a package or this is still under heavy construction by Microsoft." Yeah... tell me about it. I ran into this and basically couldn't go much further with core. Also there is not way to convert an array of bytes back into an object with Core from what I've seen (so far). There is a lot still churning and probably worth waiting out, but the impulse to use the new and shiny is so powerful. I'm not sure why StreamReader and StreamWriter weren't working for you. Are you sure the reference to the System.IO package was working correctly? For the File class (and hence the File.AppendText method), you need to reference the System.IO.FileSystem package. @Daniel - thanks for the link to the analyzer - that'll be useful. Yeah pretty sure that I had both System.IO and System.IO.FileSystem. But initially I now don't remember whether I just relied on the Intellisense preview or the actual compiler. I've been seeing really, really weird compilation behavior where a full Rebuild will throw errors, then just a build will work. So maybe I have to rack that up to user error :-) but I could have sworn I had both in there before. It started working today - maybe it was one of the builds of the day that had some weird issue?